Our Rite-Aid shopper Diane Keaton was honored with an AFI Life Achievement Award last night. At least two of her ex-boyfriends (Warren Beatty and Al Pacino) were honored years ago. Diane joked that the festive event was “The wedding I never had and the retirement party I never wanted!” You can see her trademark wide belt in person and in her photos on the walls. Apparently she inspired women attending the event to be creative, and Emma Stone turned up in this imaginative dress. She just put a Balenciaga shopping bag in her car, but Diane Keaton wasn’t finished with shopping. She dashed into the Rite-Aid drugstore in Beverly Hills to pick up a few things. A sensible shopper, she purchased some highly affordable Cover Girl and L’Oreal mascara and pencils. 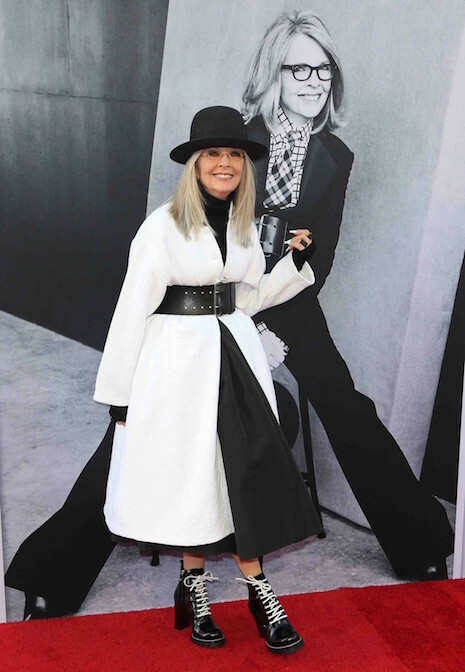 Diane Keaton is one of the few people in Hollywood who doesn’t mind being seen wearing the same thing – twice. In fact, she often wears things she particularly likes for YEARS and YEARS. (That wide leather belt!) She doesn’t cultivate designers to give her free clothing – she would much rather pick out her own clothes and pay for them! When she appears in magazines, she doesn’t want a stylist to dress her – she’s comfortable in her own wardrobe. She has high standards – her jackets are beautifully tailored and shirts are custom made. She had dinner with her daughter Dexter in Beverly Hills and Dexter shows no indication of following in her mom’s fashion footsteps…. Diane Keaton’s fashion never ceases to amuse us. She has a very specific style and likes her clothes and accessories so much she wears them over and over again. No waste there. She also piles on a ton of layers – even in the summer. You have to admire someone who can go to the Rose Bowl flea market in Pasadena when it’s 95 degrees, dressed in black from head to toe! Diane has a new HBO series, The Young Pope, with Jude Law and she plays a nun. We have the feeling she’s very comfortable in her nun clothes. 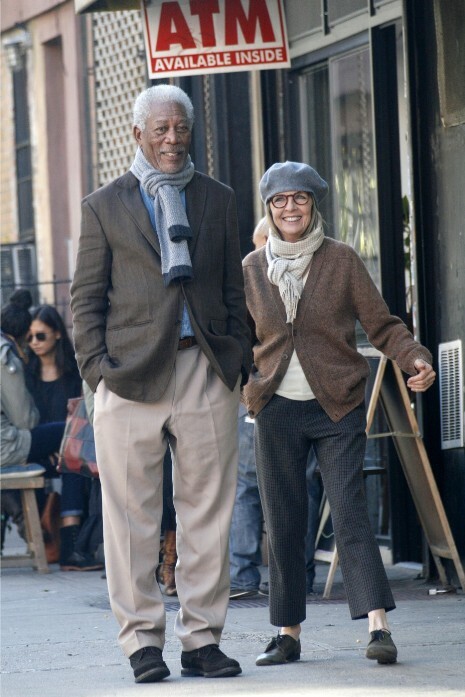 Apparently the weather has little effect on Diane Keaton’s fashion choices. Once we saw her at the Rose Bowl flea market on a 90–plus degree day wearing a layered black wool Yohji Yamamoto jacket, pants, and buttoned up shirt with a large black hat. Today she was in Beverly Hills having an animated phone conversation and she seemed oblivious to the heat. That’s a long black sweater over what might be a dress over pants. She’s also wearing grey sleeves, a long scarf, and a Crooks Castles snap back urban hat. How DOES she do it? On Mother’s Day, Diane Keaton’s children (pictured above three years ago) took their mom to the Museum of Contemporary Art in Los Angeles to see the new Uri Fischer exhibition. Fischer is a Swiss contemporary artist whose extraordinary installations and sculptures sell for millions. According to another visitor, Diane wore a black multi-layered outfit (despite the hot weather) with the usual derby and glasses and black tights with sensible shoes. Her kids Dexter, 17, and Duke, 12, were casually attired and listened intently while Diane talked enthusiastically about the art.